Well honestly, Langkakwi is not exactly a paradise for those who are looking only for authentic vegetarian food and that too in a Pure Vegetarian restaurant. 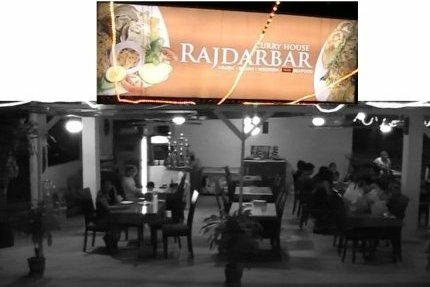 While there are several restaurants in the island that serve good vegetarian and non vegetarian food, there is only one restaurant which is pure vegetarian and it's not easy to find that. Let me start with this restaurant which is the only one in Langkawi serving only vegetarian food. This is definitely not one of the greatest restaurants in the island, but those vegans who can't eat in the surroundings of non vegetarian eaters, this is probably the only option for them in Langkawi. Price is mid-range. It's located outside Kuah and about 1km from Bayview Hotel. They serve Malay, Chinese and fast food. In Chinese, some of the nice dishes to try would be hot & sour soup, mixed vegetables etc. They also serve items like spring roll, tofu etc. They don't use onions or even garlic in the preparations. During breakfast and lunch, you get options for both buffet and ala carte. In dinner, only ala carte order is taken. The lady running the restaurant is very friendly. Although they specialize in Asian & Western vegetarian cuisine including Vegan dishes, there are also chicken and fish items for accompanying guests who are looking for non-vegetarian meals. If inclusion a few (in fact very few) non-vegetarian dishes in the menu is allowable for you, then this is certainly one of the vegetarian delights in Langkawi. On top of it, with its location and alfresco dining, you get wonderful view of a Golf Course with backdrop of the sea and mountains. The vegetarian soups, quiches, salads, pasta, humus and many more items are some of the best in the island including fresh fruit juices as well as tea & fair trade coffee. They also have a bar. Read The Fat Frog to get complete description of their offerings. It's run by an Indian and therefore this is the closest to what you can get in Indian food in Langkawi. Over all the restaurant is clean and the staffs are very friendly. It can get quite crowded during lunch time and service gets affected a bit. A good thing is it's open 24 hours serving breakfast, lunch and dinner. It's located in Kuah town and opposite Langkawi Parade shopping mall (Teo Soon Huat). This is a mid-range restaurant serving Indian and Arabic dishes. They also have western items in the menu. In Indian go for the Tandoor dishes like paneer tikka etc with naan. It's a small but quite popular restaurant in Pantai Cenang and located by the side of main road of Cenang. It serves lunch and dinner and remains open until late night. Hi, In a mid range restaurant, a main course would cost around RM25 to RM35 (vegetarian dishes would be little lesser).